Google's Chrome browser ships with a minimalistic layout by default which many users find beneficial as less chrome means more screen estate for the websites that you open in the browser. If you are used to working with a bookmarks bar in other web browsers you may miss it in Chrome as it is not displayed by default.While it takes away some vertical screen estate it speeds up accessing sites that you have added to the toolbar. There are a couple of options to display the bookmarks bar in Chrome. You can for instance use the keyboard shortcut Ctrl-Shift-B to hide and display it. The shortcut gives you some flexibility in this regard as it allows you to display and hide the bar near instantly. You can alternatively click on the settings button at the top right corner of the Chrome window and select Bookmarks > Show Bookmarks Bar from there. Now that you have displayed the bar you are free to add new sites or folders to it. I personally like to add a couple of folders to it as it gives me room to add more than a couple of visible bookmarks to the bar. Some bookmarks take up lots of space on the bar due to their title. You can right-click any bookmark here and select Edit to cut the title to reduce the space the bookmark requires on the toolbar. If you do not mind working only with icons, you can remove all of the page's title to save lots of space. You can add bookmarks by dragging and dropping the site address or the favicon if the site to the bookmarks bar, or by bookmarking a page with the shortcut Ctrl-D and selecting the bookmarks bar as the destination for the new bookmark. Other options include importing bookmarks from other web browsers or using the built-in bookmark manager to move existing bookmarks to the toolbar. To import bookmarks click on Settings > Bookmarks > Import Bookmarks and Settings to load the import module. Here you can pick a web browser you want to import the bookmarks from. 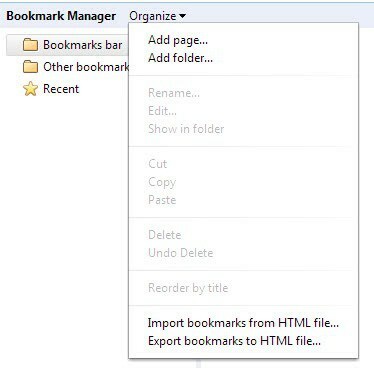 If you have an HTML file you need to click on Organize > Import bookmarks from HTML file instead in the Chrome Bookmark Manager which you can open with the shortcut Ctrl-Shift-O or by clicking on Settings > Bookmarks > Bookmark Manager. Use drag and drop to order bookmarks, to move them to another position or into our out of folders. A right-click on the bar opens options to open all bookmarks that you have added to the bar in new tabs or a new window of the browser. That's useful if you often open a sequence of sites in the browser that you visit one after the other. There are a couple of extensions that you can use to improve your experience. Bookmark Bar Switcher for instance lets you switch between multiple bars in Chrome with the click of a button, Atomic Bookmarks makes all bookmarks accessible via a single icon in Chrome's default toolbar and Bookmark Sentry makes sure you do not have duplicate or broken bookmarks in the browser. Have another tip in regards to Google Chrome and bookmarks? Let me hear it in the comments. Bookmarking is of the reason I’m still sticking with Firefox. Hell, IE does bookmarking better than Chrome. Until Chrome have a sidebar bookmark panel, I cannot use Chrome as my daily driver. I was expecting something more. This is the most basic knowledge – well, knowledge does not go waste and will help many but I’ve been implementing this. THE BEST THING ABT CHROME BOOKMARKS: You need not back them up. If you are signed in under settings, your bookmarks, settings and extensions etc are synced automatically. So when you reinstall Chrome or use it on another computer, all you have to do is to add the username to Chrome and you get all the bookmarks back w/o having to import anything. I like this feature so much that I’ve almost forgotten IE. I am a MVP not supposed to talk against MS products but truth is truth. CHROME PROVIDES MUCH CONVENIENCE OVER ANY OTHER BROWSER: Especially the sync and extensions. Martin, FYI, the common English phrase is “real estate.” Estate, by itself, is generally the property remaining after a person passes away (in the USA – in the UK, it’s something to do with housing, I think). This article is useful information for my less-than-supertech friends, thanks for posting it. I like Chrome and it might by now be my default browser – but I just can’t transfer bookmarks to it. After using Firefox for several years, I have quite a large bookmarks file with a lot of folders. Chrome doesn’t seem to be able to import it without making a complete mess – usually putting every single book mark in a folder of its own. So it’s Firefox until I can sort that out. I still can’t get Chrome to support Live Bookmarks like what I did in Firefox. My favorite cross-browser bookmark sync tool, Xmarks, refuses to sync my Live Bookmarks from Firefox to Chrome. With Firefox, I can modify every single component but I can’t do that with Chrome; not to mention IE is the worst of all. No matter what browser = if x cannot import from y , try save y bookmarks/favorites in html ,and next import from html file . Easy but forgotten by many ppl.